ESP8266 has many versions, from ESP-01 to ESP-13. When the ESP is powered correctly a red LED lights up. A blue LED indicates data traffic. 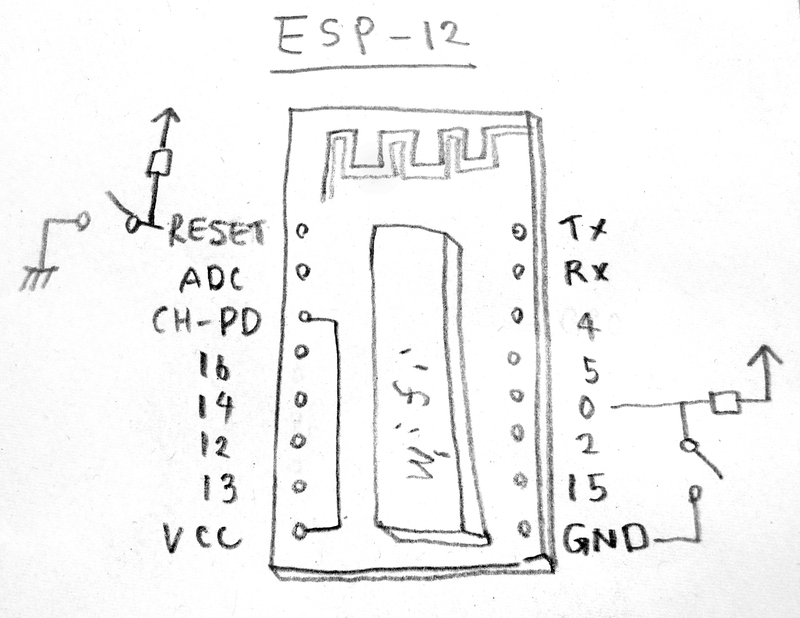 Any ESP Module can be programmed via serial, when it is put into programming-mode by pulling pin-0 to ground when it starts up. 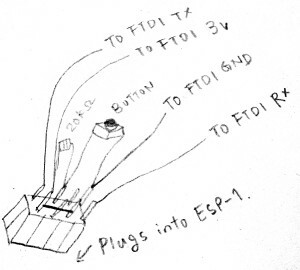 To program the Modules we used a FTDI USB programmer. 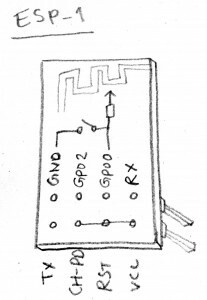 You will need to connect GND to GND, VCC to 3.3V, RX (ESP-01) to TX (FTDI), TX (ESP-01) to RX (FTDI), CH_PD and RST to VCC, GPO-0 to a pull-up resistor (20kohm or bigger) and a button that connects to GND. To do this, it is convenient if you make a special plug for it as it shows on the picture below. The programming-cable is missing a button to reset the module. The chip has to be disconnected and reconnected for a reboot. You may want to add a reset-button. 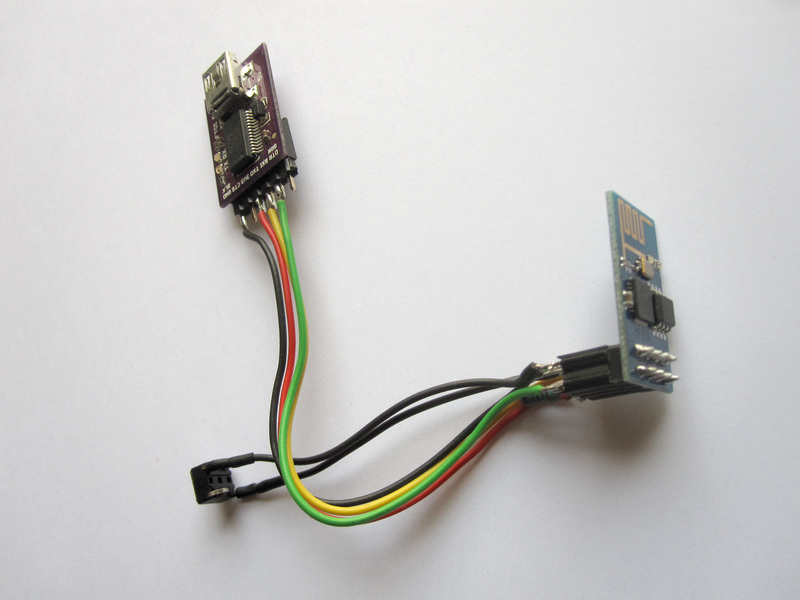 For programming, you can also use a FTDI USB programmer. 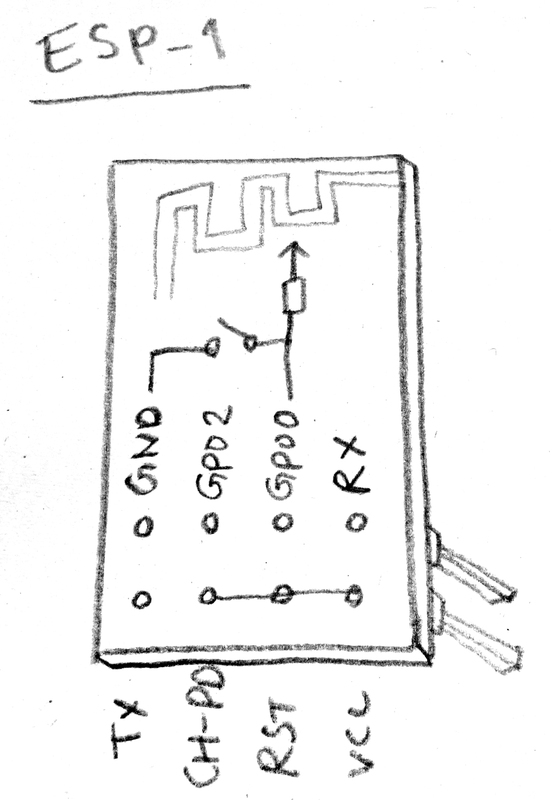 You will need to connect GND to GND, VCC to 3.3V, RX (ESP1) to TX (FTDI), TX (ESP1) to RX (FTDI), CH_PD to VCC, GPO0 to Pull-up resistor (20kohm or bigger) and a button that connects to GND, RST to Pull-up resistor (20kohm or bigger) and a button that connects to GND. 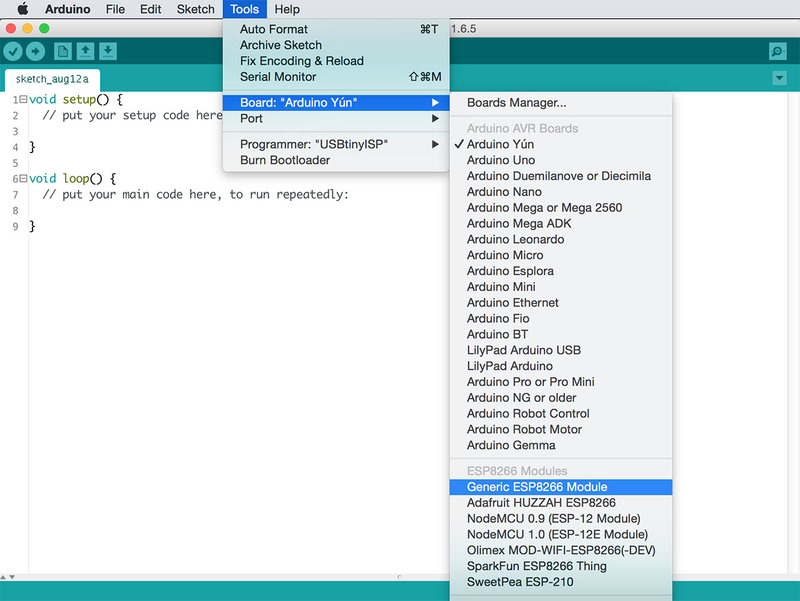 ESP-Modules can be programmed using the Arduino-IDE and it’s libraries. This is a step-by-step guide how to setup your Arduino IDE for ESP-support. 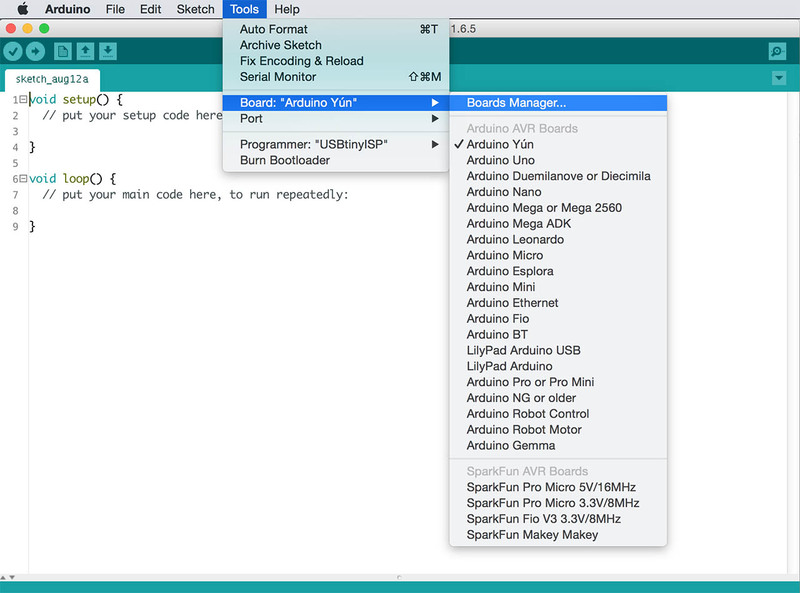 Use the Board-Manager to install support for ESP-8266 boards. 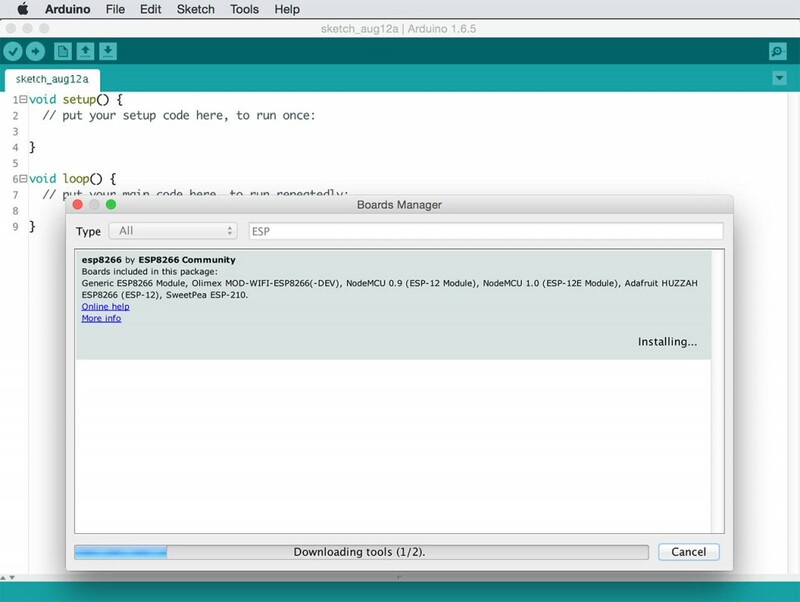 When opening the Board-Manager, the additional Board descriptions are downloaded. 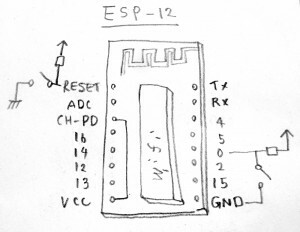 In the Board-Manager search for the “ESP”. 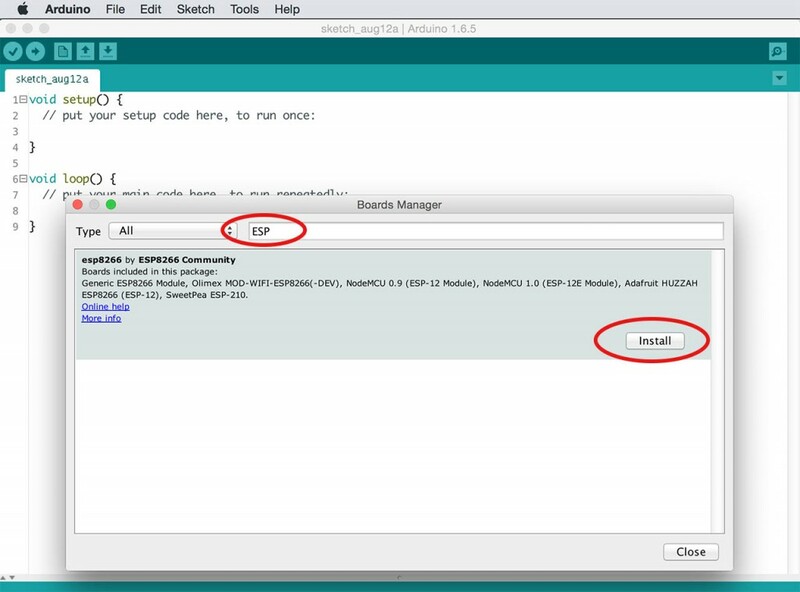 After choosing the ESP-Module, you will see more items in the Tools-Menu. 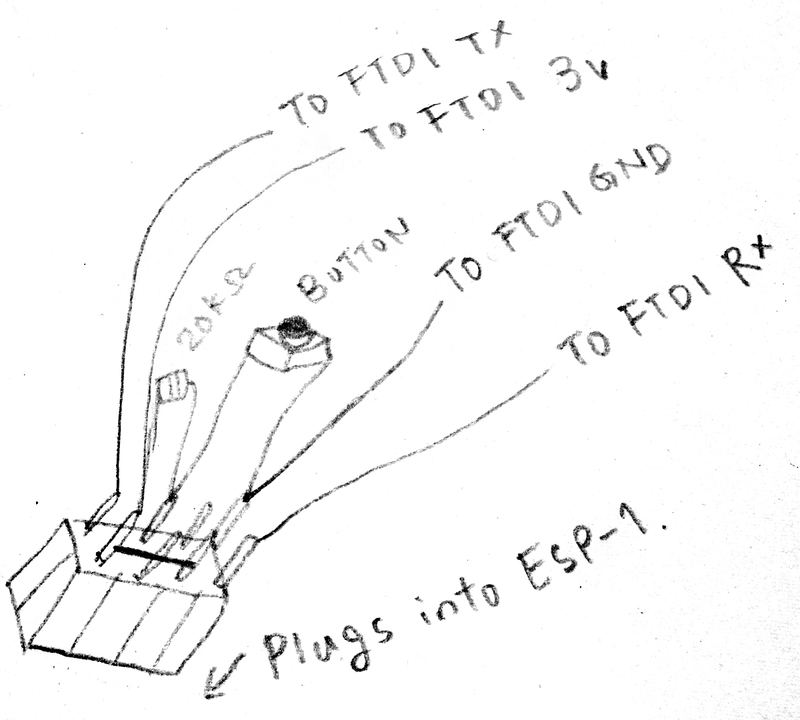 In order to program a ESP8266 Module pin-0 (GPIO-0) hast to be pulled to ground when the device boots. 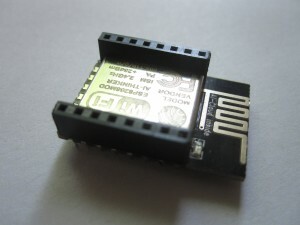 If pin-0 is pulled to ground when the modules is connected to power or is reset, then it goes into programming-mode. 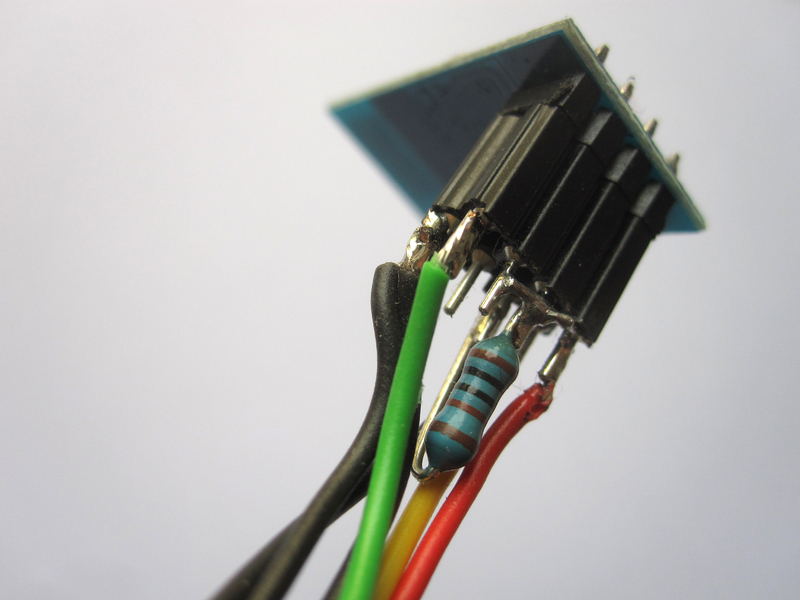 If pin-0 is _not_ pulled to ground, the module would go and start the program it was programmed with. When the device is in programming-mode, upload your sketch as usual using the Arduino IDE. 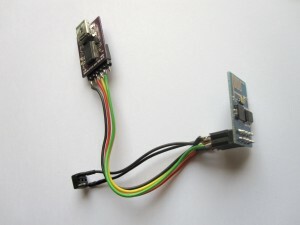 Try out the examples in ESP8266WiFi for a direct Socket connection. When we tested the Modules with max/msp we ran into problems using the client example. Data transmission stopped after sending a couple of messages. This problem seems to be related to the server implementation of max/msp. 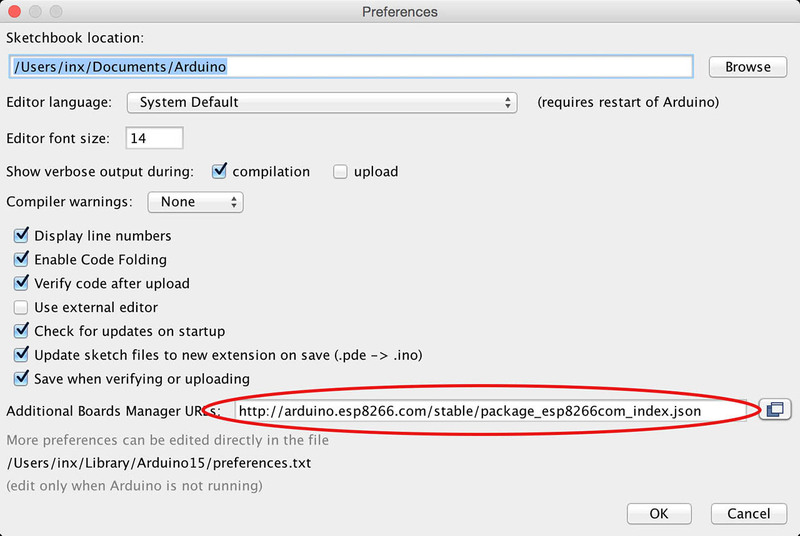 When using the examples to communication between ESP-Modules it works fine. This implementation works fine with max/msp.